This teaching Resource is designed for specialist and generalist teachers in primary, intermediate and junior secondary school classes. Ears Wide Open Taringa Areare is fun, interactive, informative and creative. It corresponds with Levels 1-4 of the Achievement Objectives in The Arts in New Zealand Curriculum (Ministry of Education, 2000). The resource consists of a teacher guide, student activity book, music score book for performance and study, and a 23 track CD of NZ music ranging from Split Enz and Salmonella Dub to Gitbox Rebellion and the New Zealand String Quartet. The material is also suitable for study and exploration of piano, percussion, string, wind, chamber, orchestral and choir music, improvisation and composition and a host of combinations of these musical elements. 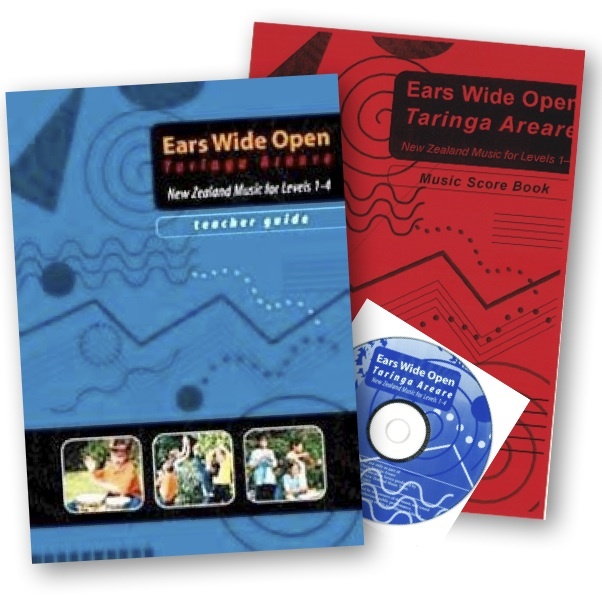 "Ears Wide Open Taringa Areare is a music resource no school should be without. The New Zealand music and musicians, carefully selected for study in this resource, provide a stimulating range of styles and genres, cultural and historical perspectives, reflecting the exciting diversity of our society. It offers teachers, regardless of their musical experience, an imaginative range of activities to select from and adapt to suit the needs of their students. The resource is reflective of the aims of the Music discipline of The Arts Curriculum of New Zealand (Ministry of Education, 2000)." - Merryn Dunmill, Director or MERC, former National Coordinator of Music. 3 v. : ill., music ; 30 cm. + 1 sound disc (70 min. : digital ; 4 3/4 in. ).